Haut Combiers is a small farm dating from the 1800's with house and barns built in the Perigordian style. It is set in a beautiful, rural location in an elevated position, giving stunning views of the surrounding Dordogne countryside. There are historic villages and towns nearby, with chateaux, restaurants and markets to visit. The farmhouse has recently been re-furbished but retains lots of French character, while having all modern facilities and comforts. Ideal for a couple, larger family, or two families sharing, being spacious but cosy, with four bedrooms and two bathrooms. The ground floor bedroom has a king-sized bed and en-suite bathroom, with a shower over the bath, plus washbasin and w.c. Also at this end of the house is a loft room, which has one double and one single bed. Although designed for children, this room can also be used by adults. The loft room has it's own stairs, which wind into the room, so there is no door. The entrance to this room does have a slightly reduced head height. Also at this end of the house, on the ground floor, is a separate w.c. with washbasin and washing machine. On the first floor there are two bedrooms and a shower room, with w.c. and washbasin.. One bedroom has a king-sized bed and the other two singles, although these can be put together to make a comfortable super-king sized bed if required. We also have a travel cot with bedding, high chair, baby bath, changing mat, plus stair gates and bed guards if required. The fitted kitchen has a four ring ceramic electric hob, oven, dishwasher, microwave, fridge freezer, kettle, toaster, coffee maker etc. The kitchen is well equipped with plenty of plates, bowls, cutlery and cooking equipment including blenders, a mixer, cake tins etc. A picnic hamper with a cool bag is also available for use. The large kitchen table comfortably seats up to ten people. There is a large sitting room area with three comfortable sofas and a wood burner (logs are provided for the colder months,) 40” flat screen TV with English free-sat, dvd player, plus games, books, toys and dvd's for both adults and children. Wifi is freely available. All bedding, bed linen and towels, for both inside and pool use, are provided. The kitchen, dining and sitting room are open plan, with French doors leading onto the terrace from both the kitchen and sitting room areas. On the terrace are a table and chairs for up to 9 people, plus parasol and gas barbecue. The terrace and a smaller lawned area are fenced off from the pool and larger garden, so that visitors with younger children can restrict access to the pool area. Access to the private 10m x 5m x 1.5m heated swimming pool is via double gates from the terrace. The gates swing back completely if visitors do not have younger children, giving open access up to the pool. The pool is conveniently situated close to the house and set in the large garden with lawns and mature trees. Sunbeds are provided for all occupants. A hammock is available in a shady spot near the pool. There is a table tennis table, boules pitch, picnic bench, and tree house with slide in the garden, plus a swing set in part of the adjoining orchard. To the front of the house is a smaller enclosed garden, also with comfortable, shaded seating. A welcome pack of bread, butter, cheese, ham, eggs, orange juice and a bottle of wine is provided on arrival and the kitchen has basics such as salt, pepper, kitchen roll, tin foil and cling film. We have a variety of animals, including dogs, cats, chickens, ducks, rabbits, horses, pigs, Dexter cattle, plus two miniature ponies, who love being petted and groomed. The ponies graze the orchard area next to the house, with a stile over the fence for access to them. Guests are welcome to help feed and look after the animals if they wish. This is a wonderful area for cycling and guests can be accompanied for longer rides, taking in some of the nearby sights or more hidden countryside. Good quality touring and racing bicycles can be hired locally, although we would advise booking in advance. There are nearby lakes and rivers, offering various activities, plus caves, chateaux, gardens and activity parks. The owners are happy to be contacted should you have queries. This includes prior to booking or before your stay and can be via face-time at a pre-arranged time, if preferred. We are English and moved to France in July 2012, having lived in the countryside in Northamptonshire for many years. With our children having moved out to start their new careers in various parts of England, it was our turn to start afresh, although Andrew still works as an architectural consultant in England and France. We brought horses, dogs, pigs and ducks with us from England, with cats, chickens, Dexter cattle, rabbits and a border collie arriving at various intervals since then. We also bought two miniature ponies, Sammy and Lipsy, who love being petted and groomed. Andrew is a keen cyclist and can advise on routes for all abilities or accompany visitors on longer routes, if required. Because there is so little traffic around us, cycling is a pleasure, with pretty, tree lined roads offering dappled shade. Cycling to Jumilhac-le-Grand for a drink or a coffee in front of the chateau is one of our regular routes, particularly on a Sunday morning when there is a small farmers market on the square in the summer. We love our new life here in this beautiful, tranquil setting, with its slow pace of life. We really enjoy welcoming visitors to Haut Combiers and sharing this special place. The area is beautiful, peaceful and tranquil. Friendly people, lovely villages and interesting towns make it a wonderful place to live and work. There is little traffic on the country roads, which makes cycling and driving a pleasure and we enjoy visiting all the sites of interest that this part of France enjoys. Although we enjoy far-reaching countryside views from all aspects of our property, we are only a short, but very pretty drive from the village of Jumilac-le-Grand with a stunning chateau, shops, bars and restaurants. Pretty, nearby towns offer everything else we need. Our family and friends from England often fly in for the weekend, as Limoges airport is only a 50 minute drive away, with flights from East Midlands and Stansted airports taking only one hour and twenty five minutes. If you are looking for a peaceful, relaxing holiday or shorter break, the house has everything to make your stay stress free. Comfortable beds and sofas, Wi-Fi and free sat English tv, lo plus several outside seating areas and a heated pool in a large garden with mature trees. Guests regularly comment that the house has everything for a relaxing stay - from the well equipped kitchen to the books, toys and games; from the sunbeds and parasols to the quiet seating areas; from the fresh eggs to the wonderful views; from feeding the pigs to grooming the ponies. We want everyone to leave Haut Combiers with happy memories, having had a wonderful holiday. For parents with younger children, we have designed the garden so that children cannot access the pool area if adults are in the house, but they still have a terrace and lawned area to play on. Children can enjoying running around in the large garden and adjoining orchard, making as much noise as they like. We have no near neighbours and love to hear children enjoying themselves. We usually have at least one hen with chicks during the summer and children love to help feed them and the pigs, walk the dogs and groom the ponies. The house sits in the middle of our land, approached by a long drive (approximately 200 metres,) so there are no neighbours in the immediate vicinity. Children can make as much noise as they like; there is no-one else to hear them. Both the larger garden, the smaller lawned area with the terrace and the front garden are enclosed, so that parents can relax. In the larger garden, there is a tree house with a slide and a swing set in the adjacent orchard. Children love to help look after and feed the animals and generally get involved with our day to day life here. We live in one of the large barns, which we recently converted, across a large yard with another barn between us and the farmhouse. The two houses are largely orientated in different directions, so visitors in the farmhouse are assured of privacy, peace and quiet. We are happy to advise on days out, nearby towns and villages, bars, restaurants and markets etc. Although there are animals on the farm, during the summer months they graze the land away from the farmhouse, so do not disturb visitors. If, however, visitors would like to get involved with looking after some of the animals, they are more than welcome. Feeding the animals (the pigs will welcome you at any time,) grooming our minature ponies and having fresh eggs for breakfast are all experiences enjoyed by both children and adults and create lasting memories. Several acres of the land and woodland are available for visitors to walk in, with either a gentle stroll or a more adventurous scramble up and down a bank. This is a wonderful place to relax and enjoy a slower place of life in a beautiful area. As one of our recent guests said, it is a wonderful place for children to just be children and for adults to completely relax. Our aim is for guests to take away happy memories of a holiday spent in this beautiful area and we will do our best to make sure you enjoy your stay here. En-suite bathroom to bedroom 3 with bath and shower over, washbasin and toilet. Shower room adjacent to bedrooms 1 and 2 with shower, washbasin and toilet. Separate toilet and washbasin on the ground floor (and washing machine.) There will be some toilet rolls in each bathroom when you arrive, plus shower/bath mats and towels. We also provide a non-slip mat for the bath and we have a baby bath as well. Wi fi is freely available. Outside the high season, we supply logs for the wood burner, so that visitors can enjoy sitting around the warmth of a cosy fire. The living room has three large comfortable sofas, with dvd's, books, games, toys, a 40" flat screen tv with English free-sat and dvd player. There are two french doors to the back garden, plus door to front garden and outdoor seating areas on both sides. The kitchen has a good sized fridge freezer. The house will have everyday items such as coffee, teabags, salt, pepper, tin foil, freezer bags, cling film, matches, bin bags, kitchen roll and loo rolls, plus a welcome pack on arrival day. The kitchen is very well equipped with plenty of table and glassware. There is a blender and mixer, plus baking trays, mixing bowls etc. A picnic basket has containers, a cool bag and picnic cutlery. The large kitchen table comfortably seats 10 people, while there is another large table on the rear terrace seating the same. There is also a picnic bench in the larger garden area. There are a variety of books in the house; fiction, local interest, non-fiction and children's books. A wide variety of games and jigsaw puzzles for all ages. The house has toys and games for all ages, plus DVDs and books suitable for children. There are lots of DVD's suitable for both children and adults. The garden area is extensive and large enough for playing racquet sports, plus a table tennis table and boules pitch. There is a swing set in the adjacent orchard suitable for children up to age 12. The terrace is immediately adjacent to the rear of the house and accessed by French doors from both the kitchen and sitting room areas. A large table, with parasol and chairs to seat up to 9 people. The pool is 10m x 5m x 1.5m and is heated, usually to around 27 degrees. It is for the sole use of the guests, with sun beds for all occupants, parasols and a solar heated pool shower. We were lucky to find this at the last minute as we were in urgent need of a base to get to the family house which had been flooded in the recent freeze. Dawn and Andrew were wonderful hosts and made us feel very welcome. There were generous provisions already in the kitchen and eggs from the chickens on a regular basis. The weather was unpredictable but there were plenty of logs to build a fire on the colder nights. The house is perfect for family living with more than enough space for young and old alike, with a big selection of toys, videos and games for outdoor and indoor activities. The finishes have been carefully chosen with comfortable sofas, a long table with plenty of chairs for meals, and a very well equipped kitchen. The layout of the bedrooms is flexible to allow parents to be near young children and more than enough bathrooms. It is very well positioned - quiet and yet within easy reach of the surrounding medieval villages and markets. I cannot recommend it highly enough - a rare find. 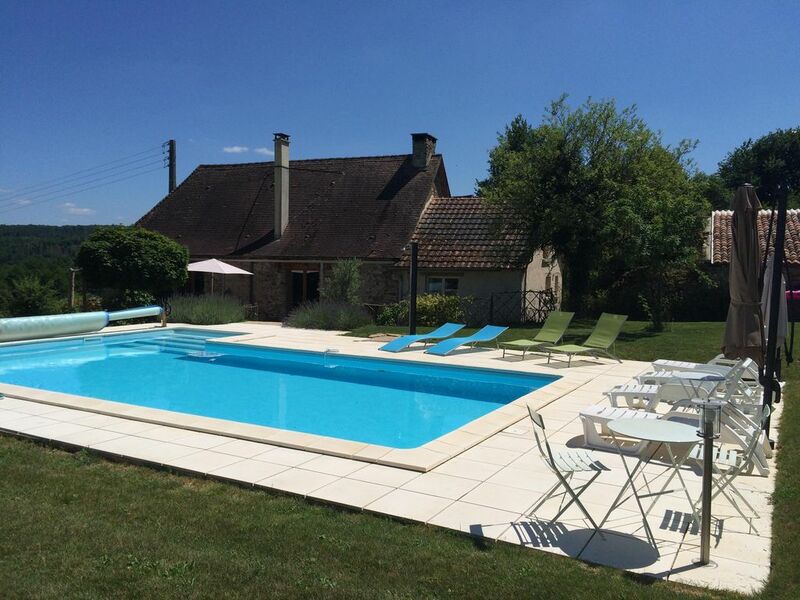 A lovely cottage nestled in the Dordogne valley with fantastic private swimming pool and adjourning a small farm where the owners lived. Everything was clean and tidy and well maintained. Andrew and Dawn (the owners) were on hand if we needed anything but never intrusive. Dawn kindly took our two grandchildren to feed the many small animals they have on the farm and the children loved that. Downstairs accommodation was excellent even with 6 adults and 2 children with a massive farmhouse style table which easily seated everyone. We ocassionally ate outside where the BBQ was located. A minor quibble was the first floor bathroom which was a bit small to accommodate 4 of the adults, although there was another bathroom on the ground floor next to the bedroom there. There was a recently designed tree house in the garden area which the children also loved. A suggestion here would be for the path to the little house be set away from the pool side to avoid the children going by the pool if there were no adults present in the garden. But this did not detract from a wonderful holiday. To hear nothing but birdsong each morning and gaze out over the valley, was extremely relaxing. We will definitely return sometime, although, potentially flying to Limoges rather than driving the full way from the ferry port. Although French roads are nothing like as busy as English, distances mean you have to accept the long travel times. Honestly, This place is amazing in so many ways. The Farmhouse was beautiful, so well equipped and comfortable we just felt at home from the minute we walked through the door. Games, Books to DVD's it had everything that you would ever need. The gardens were simply stunning and so well maintained. A heated swimming pool, Table Tennis Table, Swings and a Treehouse all there for you to use. The Gardens are very secluded, secure and child friendly. Whilst we had all these wonderful things, what made the holiday so special was the animals. our 9 year old daughter is fanatical about horses and animals in general. Coming from a busy town you don't get the opportunity to experience nature close up. There are Horse's, Pigs , Cows, Chickens and more. You just don't get the opportunity to hold baby chicks or see a 6 hour old baby calf everyday. These things will be embedded in our daughters memory for who knows how long. You can't buy these experiences.....A huge thank you to Dawn for letting Olivia spend so much time with you and the horses. Last but not least. Andrew &a Dawn. You are lovely people and we're thee perfect Hosts. We have stayed in many Holiday Villas over the years but none have the complete experience that had last week. The Owners have got this Holiday Letting lark SPOT ON.. Thank you for a lovely, relaxing break. Absolute relaxation and our best family holiday! Beautifully appointed & homely farmhouse in stunning gardens with 360 rural views and absolute tranquility. The heated pool was heavenly, even our 6 month old baby couldn't get enough of it...Andrew & Dawn were amazingly hospitable and attentive, without being intrusive at all. They went above & beyond by taking the kids (6&4) on the tractor and fully involving them in all aspects of the farm. The little extras were very special: freshly picked veggies for supper, giant fluffy pool towels, kids toys and garden games etc. In the very hot weather the house stayed cool and the garden had tree shade at all times of day. Lovely places to potter nearby if you can tear yourself away from the house & garden... We'd love to come back if it's not fully booked!! Thank you! This is our absolute favourite place in France so much so we keep coming back. The gite is wonderfully appointed and so comfortable,, the setting is idyllic with stunning countryside views . Andrew and Dawn are great hosts - nothing is too much trouble. The perfect place for complete relaxation. 5 star property - the best I have stayed in. having stayed in many gites since 1989 almost every year this is unquestionably the best. The level of equipment, cleanliness and facilities are superb. The owners have attended to every detail and are always on hand but unobtrusive. the temp. of the pool is a constant 28 deg. and is in immaculate condition. the property is isolated - (you can hear the silence) but within 10 minutes drive there is a boulangerie (with magnificent cakes), a general store (with english newspapers if you must) and a 'local french restaurant' that provides a wonderful food - forget the diet-go for it. I would recommend this property to anyone - just don't book it when I want to go back! Haut Combiers is a small farm with lots of different animals. We have 33 acres of pasture and woodland and, during the summer months, several acres of both the pasture land and the woodland are kept free for guests to enjoy. If guests enjoy helping to feed and care for our menagerie, or enjoy walking the dogs (and our cats!) they would be more than welcome. At the moment, we have dogs, cats, rabbits, chickens, ducks, pigs, miniature ponies, horses and Dexter cattle. Deer are often seen grazing the land and a wide variety of birds, including raptors can be spotted around the farm. Binoculars are provided in the farmhouse for wildlife watching enthusiasts. Numerous wild flowers can be seen in the fields and woods, with books available so that you identify the less common varieties. This really is a photographers or artists paradise. For the more active, this is a lovely part of the world to enjoy cycling. The roads are quiet and we can advise on cycle routes of various distances or accompany you. The nearest airport is Bellegarde at Limoges, 50 minutes drive away. Further airports are at Bergerac, Bordeaux and Brive. Trains are also available to Limoges, Thiviers and other major towns and cities. Haut Combiers is 6 hours drive from Le Havre and 8 hours from Calais. A car is necessary for your stay. The nearest shops are 8 km away at Jumilhac-le-Grand, which also has a beautiful square with bars and restaurants overlooking a stunning chateau. It also has pharmacy, post office, doctors and tourist office. The nearest town with supermarkets etc., is Thiviers, which is a ten minute drive. St Yriex la Perche, which has a medieval centre and is slightly larger, is approximately twenty minutes in the other direction. Sarrazac, five minutes drive away, also has a bar and restaurant. Haut Combiers is near St Paul la Roche, which is a small village in the north of the Dordogne, in south west France. The surrounding area consists of beautiful countryside, undulating and wooded, interspersed with grazing land for the local breed of Limousin cattle, as well as fruit orchards. Located within the Perigord region, famous for its truffles, the farm is also within the Parc Naturel Regional Perigord Limousin, which offers visitors a chance to discover a preserved countryside and a large variety of landscapes. The river Isle runs close by. There are numerous places and sites of interests both nearby and within an hours drive. As well as the chateau at nearby Jumilhac-le-Grand, the area has many chateaux open to visitors. Both Thiviers and St Yriex la Perche have lovely town centres, with bars and restaurants and a wide variety of shops. Local markets offer traditional French produce and are a regular feature of French life. St Jean de Cole, 15 minutes drive away, is described as one of the most beautiful villages in France and has several bars and restaurants to enjoy a drink, or a delicious lunch or evening meal. Some 15 minutes drive further on is the town of Brantome, which is encircled by the river Dronne and has a beautiful abbey. Hiring a canoe is a wonderful way to see the town and locality or, for the less energetic, small pleasure boats gently take in the sights. An adventure parc is nearby for those who enjoy more adventurous activities. There are wonderful caves to visit at nearby Villars, with prehistoric paintings and vast calcite formations, plus café and gardens. Perigueux is the capital of the Perigord and has Roman ruins and a medieval centre, with lots of shops, bars and restaurants as well. A zoo near Limoges has a wide variety of animals. There are also nearby lakes, which variously offer swimming, canoeing, pedaloes and other activities. Booking Notes: 25% deposit is required to confirm the booking, with the balance due 60 days prior to the start of the holiday. For bookings made under 8 weeks, payment in full is necessary at the time of booking. Balance of Payment: We do have to reserve the right to cancel your booking, without refunding the deposit, if you have not paid by this time. If your circumstances change, we will endeavor to either re-arrange your holiday (this can be for the following year if necessary,) or secure another booking. In the rare circumstances that neither of these options is possible, the cancellation charges below will apply. In the unlikely event and for reasons beyond our control we have to cancel your holiday we will refund in full any payments already received. However, the owners cannot be held responsible for any changes or cancellations to your holiday due to wars, threat of war, terrorism, industrial action, civil strike, airport closures or congestion, technical problems, weather or other difficulties beyond our control. As above, we will endeavor to re-arrange your holiday if possible. All travel arrangements will be the sole responsibility of the booking party. It is essential that you are adequately insured for your holiday, including cover for any activities that you wish to do. This is the responsibility of the booking party. Your personal property, including baggage, is your own responsibility at all times, unless any loss or damage is due to our negligence or failure to carry out our responsibility. Use of the swimming pool is entirely at the risk of the booking party and we cannot be held responsible for any accidents that may occur due to inappropriate usage or negligence. We are committed to ensuring that our guests enjoy their stay, but we do request that people staying at Haut Combiers respect the property and surroundings, as well as the animals we have at the farm. Damage and cleaning deposit: £300.